What is Your Nerf War Position? If your a Nerf veteran, newbie, or just curious, this test will determine what role you are suitable for when war begins. War is guaranteed to happen sometime, and it is great to be prepared. Use this knowledge wisely, share it with your allies, and keep it away from your enemys. You will be granted one of 5 possible roles. Tank, the all out barbarian type, Mercenary, the persona who gets things done quickly and efficiently, Scout, the spy and bomber of the team. You can also get Sniper, the ambusher and the most patient of the team, and Captain, the overall best player, most experienced, and has great leadership skills that will lead his squadron to victory. Now, enough talking, get to work cadet! If you were being infiltrated by another team, what would be your go to plan? Pick them of 1 by 1. 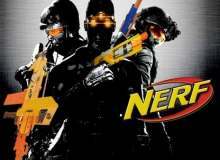 How good do you think you are in a nerf one v one, in a scale of 1-10? What is your gun style? If you were infiltrating a base, what would be your retreat protocol? What is your favorite military tactic? How do you take down a base? How do you set up defense? What is your preferred play style? Quiz topic: What is my Nerf War Position?